Finding the fan that works best for your home is a breeze, when you follow the expert's advice. Ceiling height is also important when choosing a fan. For safe operation, fan blades should be at least 7ft. above the floor. A blade height of 8 - 9ft. is optimal. Look for a motor that can do the job. "The heart of the fan is its motor," says Mark Jeffrey, marketing manager for Emerson Electric Company Air Comfort Products Division in St. Louis, MO. "You can't see it but it is the real workhorse." The amount of air moved by a ceiling fan depends on the angle, or pitch, of its blades. A pitch of 14 degrees is optimal for maximum air movement. Consider your home's style. "If you want the fan to be part of your home's decor, look for colors and detail that complement," says Casablanca Fan Company's John Pearson. "If you want the fan to 'disappear,' choose one the color of the ceiling." 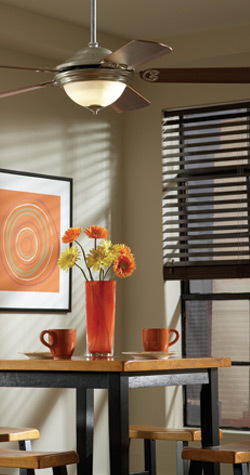 Look for light fixtures and fitters that match your fan's finish. Determine if you will need electrical wiring brought to the part of the room you want to add the fan. Since most fans replace existing lights, the wiring is usually already in place. When adding a fan to the bathroom, look for one specifically designed and UL-listed for damp locations. Want one for the patio? Choose a fan that is UL-listed for wet locations. Buy the best quality you can afford. With a higher quality fan, operation will be quieter, performance will be better and designs will be more complimentary. For safety, all blades must be at least 7" above the floor, if you have low ceilings (7" to 7 1/2" high) looks for hugger fans. If your ceiling is 3" or 4" shy of 8' consider purchasing a fan with a "Low Ceiling Adapter"